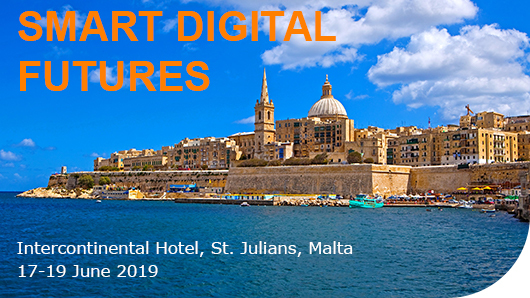 Smart Digital Futures 2019 is a multi-conference event co-locating six conferences on leading edge smart systems topics in a beautiful location. One conference fee gives you entry to six high-quality conferences on Innovation in Medicine and Healthcare, Intelligent Decision Technologies, Intelligent Interactive Multimedia Systems and Services, Agent and Multi-agent Systems and Smart Technology-based Education and Training, Smart Transportation Technologies and a paper published in one set of proceedings. These will take place from the 17th of June to the 19th of June 2019 on the island of Malta. KES-AMSTA-2019 is an established international scientific conference providing a respected forum for presenting the results of scientific research in the technologies and applications of agent and multi-agent systems. KES-IDT-19 is an international scientific conference for research in the area of intelligent decision technologies with subjects considering theory and application. This conference is dedicated to techniques that improve decision making using intelligent paradigms and other methods. IIMSS-19 is an international scientific symposium for research in the fields of intelligent interactive multimedia systems and services. Multimedia Systems refer to the coordinated storage, processing, transmission and retrieval of multiple forms of information, such as audio, image, video, animation, graphics, and text. The aim of the conference is to provide an internationally respected forum for scientific research in the technologies and applications of this exciting area. InMed-19 is a multi-disciplinary group consisting of researchers and engineers, managers, students and practitioners from the medical arena, to discuss the ways that innovation, knowledge exchange and enterprise can be applied to issues relating to medicine, surgery, healthcare and the issues of an ageing population. SEEL-2019 is a major international forum for the presentation of innovative ideas, approaches, technologies, systems, findings and outcomes of research and design and development projects in the emerging area of smart technology and its applications in education and training. STS-19 is a new conference on smart and innovative transportation technologies such as connected vehicles, self-driving cars, electric vehicles, Hyperloop, perhaps even flying cars, and emerging technologies that have implications for the transport infrastructure modelling, safety analysis, freeway operations, intersection analysis, and other related leading edge topics.